Žilina is situated in the northern part of the Žilinská kotlina basin on the crossroads of several long-distance trade routes. The territory was inhabited a long time ago. The oldest written references date back to the beginning of the 13th century, but evidence of Slavic settlement dating from the 10th and 11th centuries has been found here. The first reference to Žilina as a town is from 1312. Evidence from 1318 indicates the existence of a castle, which was, as confirmed by archaeological discovery of the remnants of the residential tower of circular ground plan, situated near the parish stairs in a position controlling the nearby Váh River. The right of an annual market was granted to Žilina in 1357. The market place, today´s tetragonal pre-planned Mariánske námestie square with its arcades and regular grid street plan, is one of the most unique features of the town. Although Žilina was mostly a Slovak town, the wealthiest layer was created by German settlers, who gradually fell into open disputes with the Slovak population. These disputes were resolved by Louis I the Great (1342-1382) who in 1381 issued the document Privilegium pro Slavis, which guaranteed equal representation of Slovaks on the city council which had hitherto been made up entirely of Germans. One of his successors, Sigismund I (1387-1437), ordered Žilina to build fortifications that probably consisted of wooden and earth ramparts (In Slovak valy) with two gates and a gate-house. The name valy has been preserved in circular streets around the square. The dominant medieval feature of the town is the Roman Catholic Parish Church of the Most Holy Trinity, built around 1400 and later rebuilt in Renaissance style. The church and the neighbouring cemetery were fortified in 1540. The Burianova veža Tower forming the part of the church area is one of the oldest Renaissance belfries in Slovakia. The Baroque Church of St Paul the Apostle with its two towers and the neighbouring Jesuit monastery date from the mid 18th century and comprise some of the more recent dominant features of the town. During the first half of the 16th century Žilina became the most important centre of the Protestant Movement in Hungary. In 1610 representatives of the Lutheran Church met in the Žilina Synod which marked the beginnings of the independent organisation of the Lutheran Church on the territory of Slovakia. Towards the end of the 17th century prosperity was replaced by a period of economic and social decay that lasted until the end of the 19th century. The decay was caused by several factors, particularly the occupation of the town by Thököly and his followers, and as a result of plague epidemics and fires. Revival came after the construction of a railway line connecting Košice and Bohumín and the Považie railway from Trenčín to Žilina. Thereafter the town became an important transport junction, a fact which was reflected in its rapid development. In the 19th century residential buildings were constructed in place of unnecessary ramparts and moats, and at the turn of 19th and 20th centuries important industrial enterprises and several banks were established. The Old Town Hall was constructed in the New Baroque and Art Nouveau style in the corner of the Main Square in place of the original Town Hall mentioned in town documents since the 16th century. Thereafter a road lined with representative multi-storey buildings was cut through in the direction of the railway station. The neologist synagogue, built in 1929-1931 according to the project of Peter Behrens, a well-known German architect, is one of the town’s unique monuments. 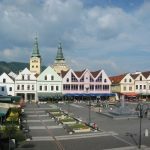 The historic town core of Žilina has been protected as Town Conservation Reservation since 1987 and with its preserved plan view it represents a relatively unusual type of founded medieval town.